We welcome everyone to join us in this celebration. The English Mass will be held at the Caritas Chapel, 10.00 am this Sunday. If you need assistance on directions, go to one of our post titled: "How to find us" http://catholiceng-olo.blogspot.cz/2014/02/how-to-find-us.html We hope to see you in Mass! The Pharisees were made blind and the blind man came to see and recognize who Jesus is. Like the Pharisees, we can also be spiritually blind, failing to recognize God especially when put in difficult situations. But God calls us to live as children of the light and who will give us this light? It is Jesus Christ, His beloved Son. And how do we respond to Him? We would like to welcome everyone to join us in Mass this Sunday, 26th March, at 10.00a.m in Caritas Chapel. Hope to see you in Mass! There will be a session for the Sacrament of Confession just before the beginning of the Mass. 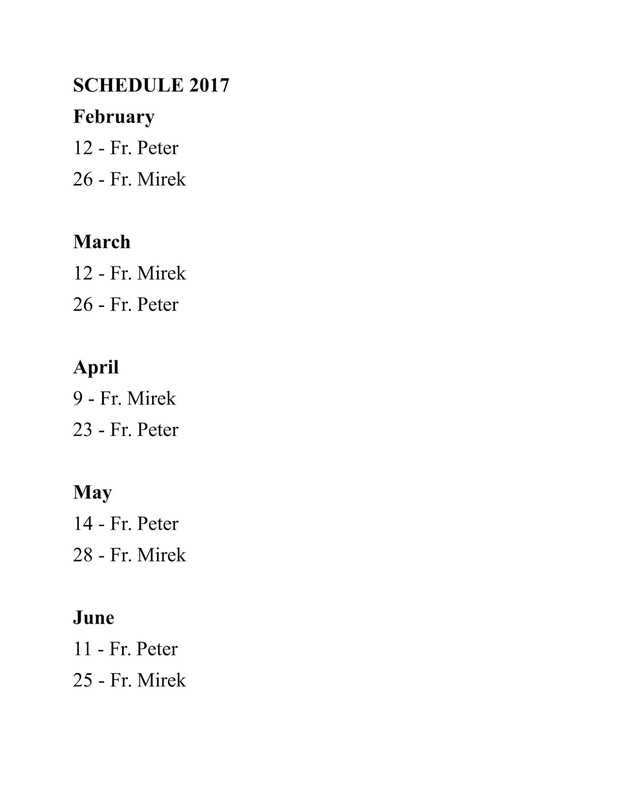 It will be held starting from 8.00 a.m with Father Mirek. For those who are interested, you can come to the chapel starting from 8.00 a.m.
We welcome everyone to join us in this celebration. The English Mass will be held at the Caritas Chapel, 10.00 am this Sunday. We hope to see you in Mass! While we were choosing the songs to be played during the Mass, the response in the Responsorial Psalm strike us hard: Rest in God alone, my soul. What does it mean for us? In this week's readings, we see ourselves anxious and worried about material needs such as food, drinks and clothing. Through the readings, we see God is telling us not to worry about these things and to rely on Him completely instead. God takes care of His creation - the birds, the wild flowers, the grass and so much more. Do we really believe that God cares for us, that He alone can provide for all our needs? Have a blessed day and hope to see you in Mass! Dobry den and hello everyone! Welcome to the second month of the new year 2017! 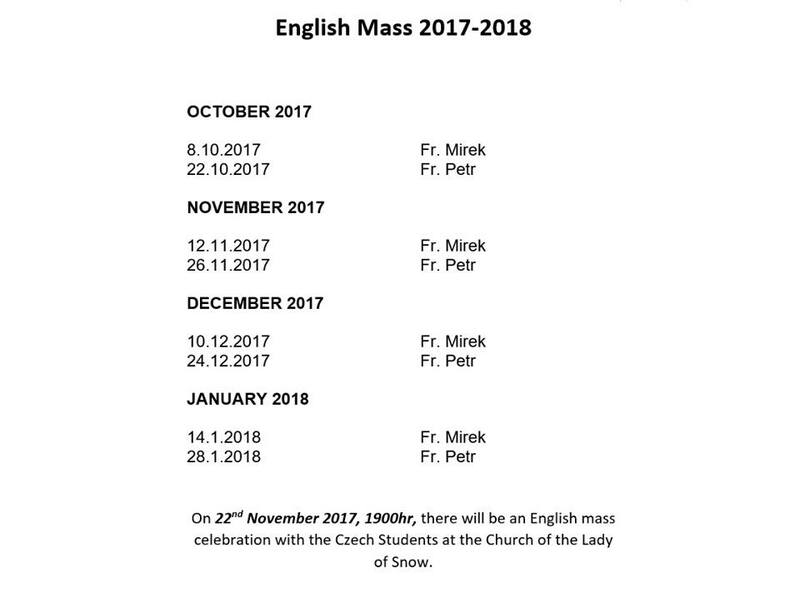 Last year was a blessed year for the English Mass community here in Olomouc because we met a lot of new people during Mass and Father Peter and Father Mirek were continuing to help us with English Mass. Most of the people who came were exchange students and some are working in Olomouc. We gained new friends and we also said goodbyes to these friends as they went back to their home countries. During Christmas, we celebrated Mass with both Father Peter and Father Mirek. We also had a group of exchange students from Croatia with us. 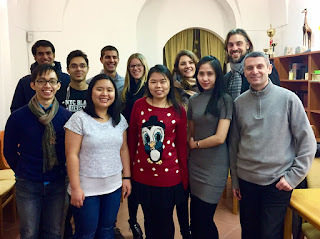 Afterwards, we had lunch together which was prepared by a group of students from Malaysia and desserts were prepared by Father Peter and Father Mirek. Our community would like to thank everyone who has been coming and helping for Mass throughout the year. Most importantly, thank God for He has been guiding our little community throughout the years. In this new year of 2017, we would like to welcome everyone to join us in Mass. It does not matter whether you are an exchange student, Czech student, working, traveler, etc. If you are new to this beautiful town and need some help with basic things, we will try our best to help. If you are a Czech and want to connect with the international community, come and join us too as we can speak some basic Czech too. 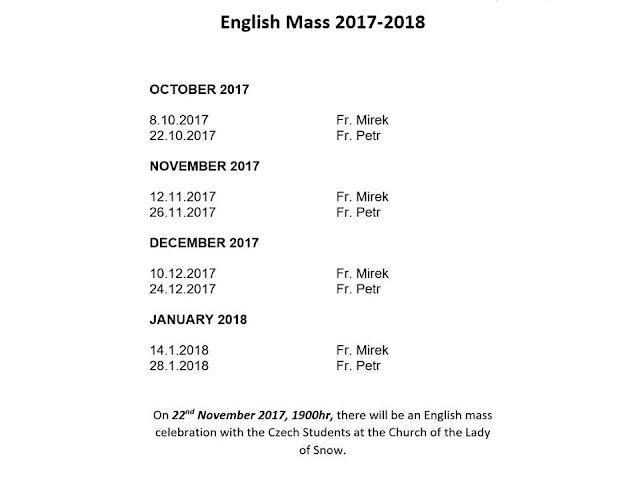 Are you searching for English Mass in Olomouc? Are you searching for Catholic international community here? You need look no further. Come and join us at all the English Mass which will be held at Caritas Chapel, 10.00 am. 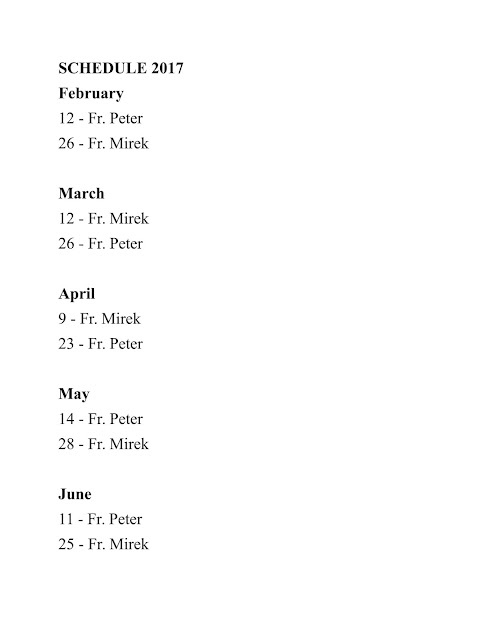 This is the NEW schedule for English Mass for the year 2017. Scroll down and click the Google map to check the location of the Caritas Chapel. Or easier, go to one of our post titled, "How to find us" to find the exact location and pictures of the chapel. 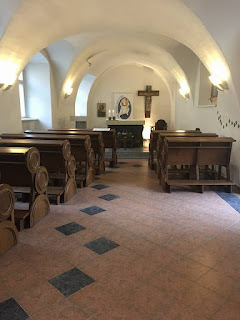 Link to the post: http://catholiceng-olo.blogspot.cz/2014/02/how-to-find-us.html Any changes will be announced in this blog. See you in Mass!